Draw a line 5 inches from center. Mark as Point A. Draw a line 22 inches down from Point A and mark as Point B. Line AB is the torso length. Draw a line 3.5 inches to the right of Point A and mark as C. Line AC is the neck of the shirt. 3.5 inches should be plenty. Only adjust if the person has a much larger neck. From Point C draw a diagonal line to the edge. Point D is on Line AB. Point D will be used to draw the bust line. Line CE is the wrap front part of the shirt. From Point C draw a line 3.5 inches to the right. Mark as Point F. Line CF should be slightly smaller than your shoulder length. Draw a line 1 inch below F and mark as Point G. Line CG should be the length of the shoulder. Draw a line down 22 inches down from Point F and mark as H.
From Point D draw a line to the right about 10.5 inches. Mark as Point I. Line DI is the ((bust measurement +2)/4) +2. For example, my Bust Measurement is 32 inches. The waist line is about 5 inches down from Line DI. You have 2 options to determine where to draw waistline. Option 1 based on your measurement. This would the length from your bust to your waist. Option 2 based on Line DB. For me, Line DB is 12.5 inches long. I split it so that it would be a little less than half on top and more than half on bottom. 5 inches and 7.5 inches. From Line DB, draw a line to the right about 8.5 inches and mark Point J. This line is the ((waist measurement +2)/4) +2. Draw a line 11 inches to the right of Point B and mark as Point K. Line BK is the ((hip measurement +2)/4) +2. Use the French Curve and ruler to connect points G&I, Points I &J, and Points J&K. About 4 inches the right of Line DB on Line J mark Point L. Draw a line going through point L touching like DI and BK. 0.5 inches to the right and left of Point L mark Point M and Point N.
Draw a diamond using Points M and N. The top point should not touch line DI. I made it about 2 inches below. This can be determined but your bust radius. Use the French Curve to draw the bust seam. If the person has a big bust and large bust radius, this seam should be drawn curvier. Repeat and mirror steps for the other side. Mark Point A directly on center fold. 22 inches down from Point A mark Point B. Again Line AB is the torso length. Draw a line to the right of Point A 3.5 inches long and mark Point C.
Go down 3.5 inches from Point A and mark Pont D.
Draw a line 2.5 inches to the right of Point D and mark as Point E.
Go back to Point C and draw a line to right 3.5 inches long and mark as Point F.
Draw a 1-inch line down from Point F and mark as Point G.
Draw a line down from Point F. I went down about 9.5 inches and marked point H. Line FH should be the same length as Line AD from the front. From the center fold, draw a line 10. 5 inches that crosses through Point H and mark as Point I. About 5 inches down from line I draw a line 8.5 inches from the center fold and mark as Point J. From Point B draw a line 11 inches to the right and mark as point K.
Use the French Curve and ruler to connect Points G &I, Points I&J, and Points J&K. On Line J, about 4 inches from the center fold mark point L.
Draw a diamond. The tips of the diamond should touch Line I and Line BK. This is a waist dart. 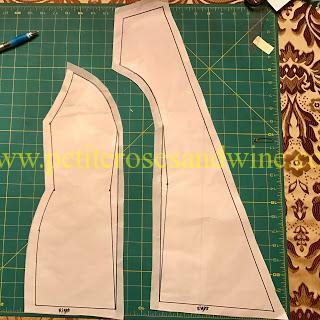 Cut out panels and add seam allowances. The seam allowance should be about 0.5 inches. Are these your measurements? If we need to make a larger size, should we just change the measurements as measured on our bodies? Thanks for posting this by the way. Ive been looking for a good pattern to use for my hmong clothes. I’m no expert by any means. I just sew for myself. Yes, these are my measurements. Just change the measurements based on your body and it should work. Can you please explain, if I change my measurements to a larger size how much or what are the number that I will be using? For example my bust is 36, waist 34 and hips is 40. How do I put these number into the paper to make a pattern of my size? Thank you and I really appreciate your kind heart of showing this in here.